Assistant coaching with Wheaton College’s women’s volleyball program this fall taught me several valuable lessons. As impressed as I was to see a talented collection of 18- to 22-year-old athletes from across the country not only on Wheaton’s roster but playing for the opponents they faced last season, one of the biggest lessons learned was the critical importance of discipline. In short, discipline may be the most crucial quality that an athlete must possess to reach the college level, earn playing time collegiately and to excel on the collegiate court. Discipline is equally vital for any team and any athlete that wants to be successful. Winning college matches takes tremendous hard work, planning, preparation, grit, skill and determination — all of which are fueled by discipline. The same is true at the high school varsity and upper club levels. The discipline I’m referring to goes by another, simpler name: good habits. Good habits are the key to achieving excellence in our skills and understanding of the game. Without good habits (discipline), talent gets wasted and never reaches its full potential. As a famed quote teaches: "We are what we repeatedly do. Excellence, then, is not an act but a habit." Another quote puts it this way: "Excellence is the gradual result of always striving to do better." The key word is always. Disciplined athletes consistently and always strive to do better. Always striving to do better is about developing and practicing good habits — or discipline. In club volleyball and specifically in the gym at Serve City, what does discipline look like? 1. Taking technical skill development seriously, and striving to continually improve and sharpen our skills in practice. Developing a fundamentally sound skill set is vital to long-term success in our sport. This kind of development requires discipline; it takes countless hours to hone your skills and expand your volleyball IQ without getting discouraged at the lengthy process this entails so that you can thrive on the court. 2. Getting to practices on time (even early -- if you're 10 minutes early you're right on time) so you can use your team's full practice time wisely. I still vividly remember attending a team's practice in an earlier season as a guest coach and watching as most of the players arrived between five and 10 minutes after practice was scheduled to start, then took another five to 10 minutes to change into their knee pads and volleyball shoes. Not surprisingly, this was a team that wasn't competitive in most matches, and most of its players stopped playing volleyball the next season. 3. Practicing with a purpose. Stanford University won the NCAA volleyball title in 2016 and 2018. Stanford has attained a level of success in the sport that only two other college programs have come close to achieving. One of the hallmarks of the program is its attention to detail. The coaches and players work diligently on every detail during training. The spring before the Cardinal's 2016 national title, the coaching staff had its players spend five straight weeks serving solely from their zone 1 to the deep corner of zone 5 in every training session involving serve receive. Their goal was for the players to become so adept at serving deep zone 5 that, when the fall season began, they would serve teams out of system with this one simple strategy. 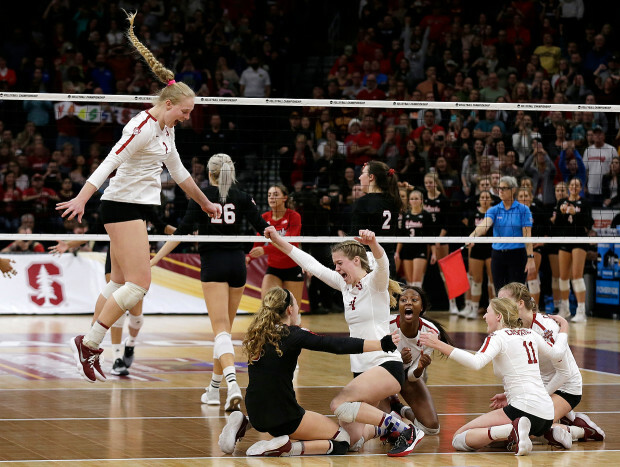 Their plan worked; Stanford was one of the top serving teams in the nation that season and used outstanding serving to drive the team all the way to the NCAA championship. 4. Practicing with passion. This refers to the level of energy the players pour into training. Do you compete in each drill with competitive zeal? Are you fully engaged in every aspect of practice? Do you approach practice with the same drive that you demonstrate when playing in the playoffs of a weekend tournament? Do you “practice the way you want to play, and play the way you practice"? 5. Taking care of your body. Proper sleep, a healthy diet, plenty of fluids and regular fitness and exercise are instrumental to preparing our bodies to be at peak levels of performance in practices and matches. We can't expect to be at our best if we don't properly care for ourselves. How we treat our bodies before a tournament also says a lot about our level of commitment to our team. 6. Maintaining the right conduct on the court. Studies show that our mental approach to competition has a large bearing on our performance as athletes. Keeping an upbeat mental attitude, delivering positive verbal affirmation and words of encouragement to teammates and maintaining confident body language and tone of voice on the court are crucial to success. All of these traits take discipline to incorporate into our on-court demeanor. 7. Successfully riding the highs and lows that come with sports competition. Wild swings of momentum are common in volleyball. One minute your team has a 12-3 lead. The next minute your opponent has tied the set at 14-14. Discipline is essential to having the poise, confidence and grit to overcome the many challenges thrown our way in this sport. It takes practice to develop the habits necessary to be able to weather any storm on the court, from your team playing shorthanded one day to falling quickly behind and needing to rally from a large deficit. 8. Training when you don't feel your best. This doesn't mean coming to practice with a 103-degree fever. But it does refer to pushing through the minor aches, pains and illnesses that lesser athletes lean on as excuses to avoid practicing and instead showing up to practice ready to get "3-percent better" even when we don't feel like training. Individual improvement is largely a choice. We can either choose to only practice when we feel great and miss out on opportunities to truly grow, or we can commit ourselves to the process of player development even on those days when we're sore, tired, less motivated or a bit sluggish. Choosing the harder but better path to individual growth requires discipline. Like a muscle, discipline develops into a hardened habit when we exercise it regularly. When helping youth athletes prepare for volleyball tryouts, parents and coaches typically focus on the basics – wear the right gear, warm up, execute the drill – and often overlook mental preparation. But for young volleyball players, mentally preparing for tryouts can be the difference between making the team or being left off a roster. These tips can help kids get into the right state of mind for tryouts. The pressure that youth volleyball players put on themselves to perform well during tryouts can result in added stress and anxiety. Dr. Justin Anderson of Premier Sport Psychology said it’s normal for kids to have some anxiety during tryouts. The challenge is for athletes to learn to control the anxiety and not let it hinder their performance. “We help them realize there are strategies for how to manage the escalations,” Anderson said. One tactic Anderson recommends is a breathing technique. He instructs athletes to take a 10-second breath (five-second inhale, five-second exhale) to help slow down their heart rate and get into a calm state. If an athlete is feeling stress before a serving drill, for example, he or she can take a few moments to perform the breathing exercise before it’s their turn at the line. Anderson also works with athletes to help divert their attention when needed. He teaches athletes that they can shift their attention from one thing to another to improve their mental state. At tryouts, athletes are focusing on whether or not they will make the volleyball team. Coaches and parents can help them calm themselves by diverting their attention to something else, such as a specific drill or exercise. Instead of letting a visibly anxious player spend time at the back of the gym counting how many athletes are competing for a roster spot, engage the player in conversation about how to perform the upcoming digging drill, or walk through hitting footwork to help take the athlete’s mind off the stress that tryouts can often bring. Anderson states youth athletes may think their entire identity is tied to their connection to a sports team. Young players might only see themselves as volleyball players and base their identity on being part of the volleyball club. That could be where they met their friends and their main source of both physical and social activity. For these athletes, it’s important to help them keep perspective as they head into tryouts. They need to see there are options outside of this particular volleyball team in case they don’t make the roster. Anderson recommends coaches and directors be upfront with athletes at the beginning of evaluations. Telling kids there will be cuts, and then giving them options of other volleyball teams or leagues they can join, can help kids understand their volleyball career doesn’t have to end after tryouts. Provide the kids with a list of community volleyball camps or instructional leagues they could potentially join if they don’t make the club. Anderson said parents can help kids by teaching them how to cope with the results if they don’t make the team. Together they can create a path to join a new volleyball league, figure out a way to improve for next year or even try a new sport or activity. It’s natural to watch other competitors at tryouts, but this can risk hurting a player’s confidence. If a young volleyball player is focusing on how well other athletes are performing, they might lose assurance in their own abilities. Instead, athletes need to stay in their bubble and only focus on what they can control – their own performance. Players should try to only think about the drills and techniques they need to execute and how to do them to the best of their ability. Helping youth realize they can’t control how everyone else does, only their own performance, can help ease some of the stress they might be feeling. Some volleyball players can benefit from simply talking through pre-tryouts stress with a parent, coach or other confidants. Players can feel at-ease by discussing any fears they might have heading into the evaluation session and getting honest feedback from a trusted resource that they can use throughout tryouts. Maybe they are worried about their serve and they just need someone to listen to them explain why they are stressed about the serving drills. That alone can help alleviate some anxiety. Practicing regularly before tryouts can help calm the minds of youth athletes. Coming into tryouts prepared can help the player feel more confident during evaluations. If they know they’ve practiced and prepped to the best of their ability, then they can enter tryouts feeling assured and fearless. Author Bio: Chris Knutson is co-founder of TeamGenius, a leading player evaluation software that helps youth sports organizations by streamlining tryouts and player evaluations. At a Windy City Power League tournament on Saturday, I watched the pre-game warm-ups for the opening match of one of the 14U pools. During shared court time, one team was working efficiently on a blocking and hitting run-through and then transitioned quickly into a fast-paced ball-control drill. The other team lazily sloughed through the motions of partner passing, though it looked more like partner shanking; the majority of passes were off-target thanks to a mix of poor passing technique and halfhearted focus and effort. You can safely guess the winner of the match. The more disciplined warm-up team won handily. It wasn't solely because they warmed up more purposefully. They had the more experienced, more skilled and more talented team. But, just from watching their warm-ups and their performance on the court, it was clear they were the kind of team that probably practices with the same level of discipline they displayed in warm-ups and the match. Their opponent, on the other hand, looked like it was playing at a backyard summer barbecue. Good habits eventually lead to good skills and knowledge of the game. It might take months or years to see tangible fruit from your labor, but at some point positive habits will yield positive results. And good habits take discipline. As our club's theme quote says, "We are what we repeatedly do. Excellence, then, is not an act but a habit." A similar quote puts it this way: "Excellence is the gradual result of always striving to do better." Taking technical skill development seriously, striving to continually improve and sharpen our skills in practice. Developing a fundamentally sound skill set is vital to long-term success in our sport. This kind of development requires discipline; it takes countless hours to hone your skills and expand your volleyball IQ without getting discouraged at the lengthy process this entails so that you can thrive on the court. Practicing with a purpose. Stanford University won the NCAA volleyball title in 2016 and reached the Final Four in 2017. One of the hallmarks of the program is its attention to detail. The coaches and players work diligently on every detail during training. The spring before the Cardinal's last national title, the coaching staff had its players spend five straight weeks serving solely from zone 1 to the deep corner of zone 5 in every training session involving serve receive. Their goal was for the players to become so adept at serving deep zone 5 that, when the fall season began, they would serve teams out of system with this one simple strategy. Their plan worked; Stanford was one of the top serving teams in the nation that season. Practicing with passion. The other day I substitute coached for our Wheaton 18 Blue team. One thing that impressed me was the level of energy the players poured into training. The players competed in each drill with competitive zeal. Whether performing a simple 2v0 drill or competing in a serve receive game, the athletes were fully engaged. They approached practice with the same drive that you witness in the playoff round of a weekend tournament. It brought to mind the axiom to "practice the way you want to play, and play the way you practice." Taking care of your body. Proper sleep, a healthy diet, plenty of fluids and regular fitness and exercise are instrumental to preparing our bodies to be at peak levels of performance in practices and matches. We can't expect to be at our best if we don't properly care for ourselves. How we treat our bodies before a tournament also says a lot about our level of commitment to our team. Maintaining the right conduct on the court. Studies show that our mental approach to competition has a large bearing on our performance as athletes. Keeping an upbeat mental attitude, delivering positive verbal affirmation and words of encouragement to teammates and maintaining confident body language and tone of voice on the court are crucial to success. All of these traits take discipline to incorporate into our on-court demeanor. Successfully riding the highs and lows that come with sports competition. Wild swings of momentum are common in volleyball. One minute your team has a 12-3 lead. The next minute your opponent has tied the set at 14-14. Discipline is essential to having the poise, confidence and grit to be able to overcome the many challenges thrown our way in this sport. It takes practice to develop the habits necessary to be able to weather any storm on the court, from your team playing shorthanded one day to falling quickly behind and needing to rally from a large deficit. Training when you don't feel your best. This doesn't mean coming to practice with a 103-degree fever. But it does refer to pushing through the minor aches, pains and illnesses that lesser athletes lean on as excuses to avoid practicing and instead showing up to practice ready to get "3-percent better" even when we don't feel like training. Individual improvement is largely a choice. We can either choose to only practice when we feel great and miss out on opportunities to truly grow, or we can commit ourselves to the process of player development even on those days when we're sore, tired or a bit sluggish. Choosing the harder but better path to individual growth requires discipline, and, like a muscle, develops into a hardened habit when we exercise it regularly.